Division of Rheumatology, Johns Hopkins University, Baltimore, Maryland, USA. Rheumatoid pachymeningitis is a rare complication of rheumatoid arthritis (RA) and is a diagnosis of exclusion1,2. 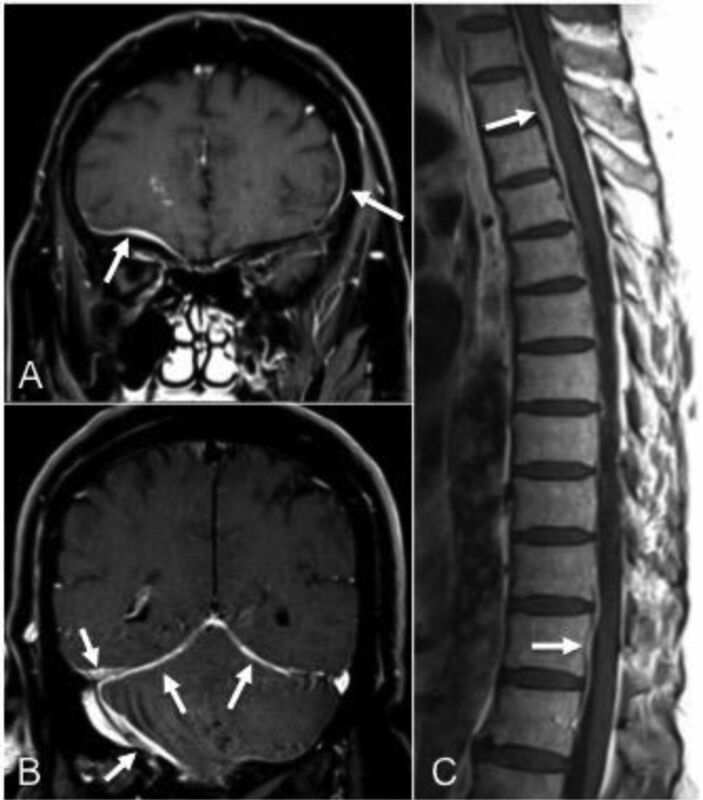 A 57-year-old male from El Salvador with a history of longstanding seropositive, nonerosive RA and interstitial lung disease, who was noncompliant with medical treatment, presented with severe occipital headache for about 8 months. The headache was associated with photophobia, phonophobia, and nausea, and was exacerbated by bending, laying supine, and coughing. Serologic evaluation was positive for high-titer rheumatoid factor/cyclic citrullinated peptide, elevated inflammatory markers, negative antinuclear antibodies and antineutrophil cytoplasmic antibodies. Several lumbar punctures were performed, showing negative gram stain, normal glucose and protein, and mild mononuclear pleocytosis. Cerebrospinal fluid (CSF) cytology was negative, as were CSF mycobacterial, spirochetal, other bacterial, fungal, and viral studies. Magnetic resonance imaging of the brain and spine demonstrated pachymeningeal enhancement (Figure 1). Biopsy of the dura was inconclusive, with no specific pathologic changes. Coronal fat-suppressed postcontrast T1-weighted images (A, B) through the brain demonstrate abnormal pachymeningeal enhancement involving the floor of the right anterior cranial fossa and the left frontal convexity (arrows in A), and along the bilateral tentorial leaflets and the right lateral aspect of the posterior fossa (arrows in B). The punctate foci of enhancement in the frontal lobe are because of an incidental developmental venous anomaly (A). Sagittal postcontrast T1-weighted image of the thoracic spine (C) shows pachymeningeal enhancement along the anterior aspect of the thecal sac (arrows in C). Given the aforementioned negative infectious investigations and no evidence of systemic malignancy, the diagnosis of rheumatoid pachymengitis was entertained. The patient was given intravenous methylprednisolone 1 g daily for a total of 3 days, with rapid improvement of the patient’s symptoms. He was discharged on a tapering regimen of prednisone and began taking methotrexate 15 mg weekly, with a plan to increase to 20 mg. Early detection of rheumatoid pachymeningitis and initiation of steroids are essential to prevent neurological complications3,4. Ethical approval was not required by the authors’ institution (Johns Hopkins University). ET received support from Jerome Greene Foundation and Rheumatology Research Foundation.
. Rheumatoid meningitis: radiologic and pathologic correlation. AJR Am J Roentgenol 2006;186:1181–3. Rheumatoid leptomeningitis: magnetic resonance imaging and pathologic findings — a case report. J Neuroimaging 2010;20:192–4.
. Rheumatoid meningitis. Front Neurol 2011;2:84.
. Clinical manifestations and treatment of rheumatoid pachymeningitis. Neurology 2007;68:1079–80.